From the moment he was conceived in an artist’s studio, Rio Yañez’ fate as an artist was sealed. Born and raised in San Francisco’s Mission District, Yañez is a curator, photographer, and graphic artist. As a curator he is a frequent collaborator with his father, Rene Yañez, and the pair have been developing exhibits together since 2005. he has exhibited in cities ranging from San Francisco to Tokyo. His reimaginings of Frida Kahlo have included the Ghetto Frida Project, a series of prints, writings, and performance pieces featuring a thugged-out Kahlo. Yañez is also a founding member of The Great Tortilla Conspiracy, the world’s most dangerous tortilla art collective. 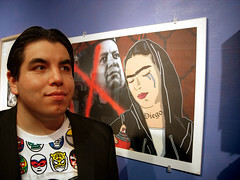 Yañez currently works at the South of Market Cultural Center (SomArts) as a curator and manager. My primary interest, as an artist, is in combining icons and mythologies. As a child growing up Chicano I was often frustrated that Chicano art and iconography rarely intersected with my personal mythologies of comic books, pro-wrestling, music, and Godzilla movies. My images bring together my heroes, friends, and childhood fantasies with Chicano aesthetics, traditional images, and politics. They are a fulfillment of my childhood yearnings and an exploration of my relationship to the worlds I walk between. Rio Yañez photographed by Harry Gamboa Jr.
Rio Yañez has been featured in artworks and projects by a variety of artists. Throughout his infancy and childhood he was a frequent subject of painter Yolanda M. Lopez. During his time at Calarts, Yañez was featured in Shizu Saldamando’s Looking at Art video project. He has been photographed by Harry Gamboa Jr. as part of Gamboa Jr.s Chicano Male Unbonded series. Chilean artist Mabel Negrete has featured him in two of her performance projects, Changing Places Changing Bodies and Wanna be Black, Wanna be White. Most recently, Rio Yañez was included in muralist Mona Caron’s mural on 24th and Sanchez streets in San Francisco. He is depicted walking down 24th street, past El Trebol, in the city’s Mission District. My illustrated guide to San Francisco’s Mission District, My Mission, can be purchased in stores throughout the Mission District and online from Mission Loc@l.
My work is featured in the art book Street Art San Francisco: Mission Muralismo and can be purchased at bookstores nationwide and at amazon.com. Both of my zines Peligroso Pop and The Ghetto Frida Reader come in and out of print and can be purchased by contacting me. This website is terrific! Please put me on your list for activity information. I’m always interested in what other talented Yanez’s are up to in this world…congrats. I just so happened to stumble across this site and was really impressed of the artisits images and couldnt help but be filled with admiration and isnpsiration. I love seeing what beautiful work can come from Chicanos and Chicanas who are moved to do more than just be part of the background. Thank You brother and please keep up the great work. Rio- congrats, sorry I’ll have to miss the opening…I’ll be at the radio station spinning some girl in a coma for ya.